Praying For an Open Door. The newest owners of an Amy Glasscock original painting! After 2 months of work I am finally finished with this one. 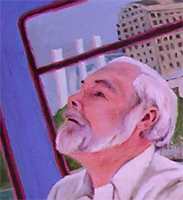 It incorporates several things that I have wanted to paint for a long time: the Austin skyline, graffiti, and the bus. I have been riding the bus to work since last summer, and every time I cross the Lamar bridge I take a moment to admire the beauty of my city. One day I decided that every time that I cross the river from then on, I would pray for the people of Austin. I liked this idea because I think that I need more beautiful reminders in my life (like the view from the Lamar bridge) to inspire me to talk to God mainly because that is where change for good begins. So as I thought about making this painting I brought my camera along with me on the bus and snuck photos of people. 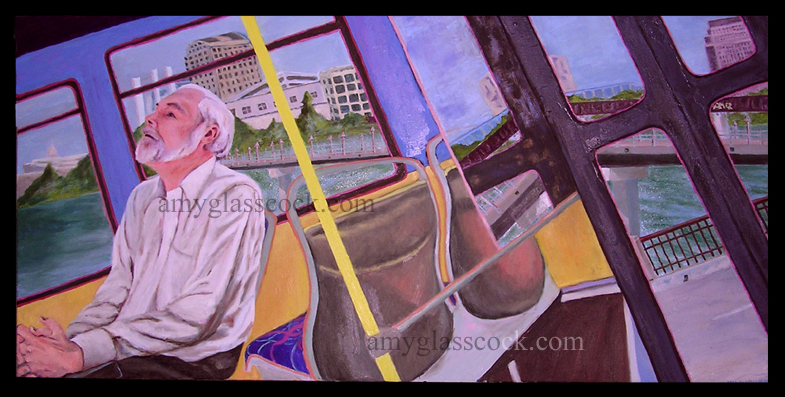 (Thus, the guy in the painting is a real guy on my bus.) One day I realized that the door looked like an upside down cross. I began to think about doors as a symbol of access. I thought about how each day I had been praying as I crossed this bridge for Austinites to know and have access to God. So this painting became a symbolic representation of those prayers. Thus it is titled "Praying for an Open Door" in reference to the scripture in the Bible where Jesus says "Here I am! I stand at the door and knock. If anyone hears my voice and opens the door, I will come in and eat with him, and he with me." (Revelations 3:20) So I flipped the door to make it look like a cross, and I made the man look like he is ready to get off of the bus with the hopes of the door opening soon or another intended interpretation is that the man is praying. To actually get off of the downhill bus he must step forward and go through the cross shaped open door. Just like to have access to God we must "go through" Christ. In other words we must accept his sacrifice and step out in faith. That is in essence my prayer for Austin, that the people here will "walk through the door". Technically this painting was inspired a lot by Wayne Thiebaud. Especially the color choices. I also experimented with the red and pink lines to increase color interaction, just like Wayne does. Click here to see a comparison in my "artistic heros" section. so that we may proclaim the mystery of Christ, for which I am in chains. Pray that I may proclaim it clearly, as I should. be always full of grace, seasoned with salt, so that you may know how to answer everyone.